Looking for free tools to turn you into a better inbound marketer? Then you've found the right place. There are many inbound marketing tools you can use to improve your strategy without having to spend a penny. As inbound marketing involves so many different aspects: writing, design, analytics, management and more, we've collected a variety of tools to benefit your entire strategy and transform you into a professional inbound marketer. Writing is a core part of any inbound strategy. The tone and style you use in your blogs, website pages, emails and social media posts will influence how your ideal buyer persona will interact with your business. As writing is so important, you need to get it right. 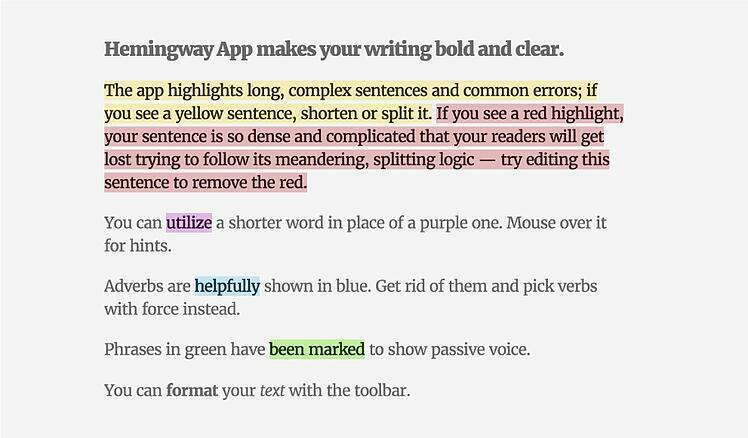 Hemingway Editor helps you improve the readability of your content and suggests improvements to make it even better. This tool also identifies grammar issues. I would also recommend Grammarly as a useful app as it integrates with your accounts. But it only offers a free trial. Along with creating helpful and relevant content for each stage of your buyer's journey, your headlines need to be engaging and stand out. The CoSchedule Headline Analyzer helps to add more emotion and drive into your headlines which will help benefit your overall click-through rate. As it's free to use, you should use it when creating blog titles and choosing titles for your website pages. If you're relying on stock images because you haven't got design experience (or you haven't got access to a design team), then you really should use Canva. Canva is a life saver for inbound marketers who need an easy design tool to create basic and high quality images for blogs, pages and social media posts. Of course, having your own in-house designer will be more beneficial in the long-run but as a temporary short-term tool, you can't go wrong with Canva. Managing an inbound strategy can get complicated. You have many moving cogs in your inbound machine and to keep on top of everything, you need an effective management system for your team. Trello is a simplified management tool where you can create checklists, add comments, upload file attachments and assign tasks. One of the best things about Trello is its simplicity, it's what you need when organising your campaigns and monthly tasks. If you want a project management system that is better suited to inbound marketing strategies, then we recommend Do Inbound (which requires a monthly/annual subscription). When you work online everyday, you need an effective storage tool. Dropbox is the answer. Because it's an online tool, Dropbox can be used anywhere and it invites teams to work collaboratively. Everything is stored in one place. It reduces the chance of important files from getting lost and you can easily edit and update your inbound strategies from your office or on the move. If you're taking advantage of video marketing then Wistia is a must. With Wistia you get incredible analytical capabilities to analyse how your videos are watched. You can see how long viewers watch it for, where viewers lose interest and more analytical options. If you give marketers a choice between Wistia and YouTube, Wistia is the popular choice. The free version provides a limited number of video spaces so if you're creating more videos, then you may want to consider subscribing. But before you buy, make sure you try it for free first. Google Analytics is a must for anyone managing a website. It's a beneficial analytics tool you can use to get reports on the audience you're attracting and the overall performance of your site. Many people think Google Analytics is only great for analysing how your site is performing but it can also be used to improve your inbound marketing. Especially in regards to your audience, Google Analytics helps you determine what kind of visitors you're bringing to your site. Are you attracting your ideal persona? You could also discover another type of customer you've never considered before. In-page analytics helps you get a clear sense on how visitors are responding when landing or navigating through your website. If you've got a high bounce rate it's a clear indication you're failing to provide an inbound experience and this needs to be fixed ASAP. As a Platinum HubSpot agency partner, we're promoters (and fans) of HubSpot. For companies who use inbound marketing as a large part of their marketing strategy, Hubspot is a valuable tool. There are paid and free options available. The HubSpot CRM is absolutely free. This Customer Relationship Management tool can be used by your entire team. You can store up to 1,000,000 contacts and your interaction with different leads. It's a beneficial resource for your team to store contact information and by updating company profiles you can see what leads and customers you have. For your sales team, this is a valuable tool for approaching prospective clients. The HubSpot CRM is free. You'll have to pay a monthly subscription if you're interested in the marketing and/or sales software. With marketing, you get the full inbound package: content creation, email marketing, social media integration, marketing analytics and much more. The sales software package provide emails templates, the ability to call from your browser and more. Want a free inbound marketing techniques guide? At Digital 22, our inbound teams sat down together and pooled their insight and skills into this one eBook. It's full of tips and techniques you can use to significantly improve how you manage and execute your inbound strategy. It's free to download.